I'm the operator of a 2-pipe steam system in a 60 (and 50) year old nursing home. For some reason neither I nor any of the techs who've come in to do work can figure out why my condensate is gaining a couple of hundred gallons a week, while the freshwater feed (that I've got a meter on) shows no new water being added to the system, since there's no demand given the main condensate tank is overflowing anyway. I'm running a Hurst boiler at 3-5 pounds. It was enabled 4 months ago when the outside temp dropped low enough. For the first 3 months I had enough condensate loss to cause the system to add about 10-20 gallons of fresh feedwater a day. That's as expected, as I'm confident that there would be some condensate loss due to evaporation from the top of the condensate tank, and minor leaks in the network of pipes throughout the building. For the past month, however, I'm ending up with more condensate than I started with. I know that it isn't fresh water being fed in by the automatic system, because I've ensured that by closing off that water valve (just long enough to test this). I've made sure that it isn't from water leaking into the steam pipes from a couple of heat exchangers used as supplemental potable hot water heaters (actually, it is on one, but I've isolated that both on the steam and return side). I've got two 300 gallon condensate tanks that I dumped nearly all of the water out of (enough was left to keep the system running). Even with no new fresh feedwater, both tanks fill up to overflowing in a little over a week. Because the building is old and has been expanded twice, there is the original steam piping in half the building, and new piping in the other half (which also has a heat exchanger for a heating water system for part of the building). The old part is where all the extra condensate water comes from. The new part acts like I expect, and will lose a normal amount of condensate throughout the day. I've confirmed this by shutting down the pumps that move condensate from the old part of the building to the new. The new part has a steam line that runs to the old part in the opposite corner of the building, where the original boiler used to be. And there is a single pipe that runs from the old part to the new for pumping condensate collected in the old, original part of the building to the new boiler room. I get way too much condensate in the old part, and that gets pumped to the new boiler room and overfills the new condensate tank. Has anyone else experienced anything like this, where you get more water coming back than going out? Especially in only half a building? It's driving me nuts because it screws up my water chemistry. It acts like I'm getting lots of fresh tap water added to the system, because the conductivity and pH readings are close to straight tap water, and not what I had a little over a month ago. Apparently this system has had this same problem for the past 10 years, where for a few months in the middle of winter it will overflow its condensate tanks, and then go back to normal. In the summer I can empty the tanks and they stay empty until I start up the boiler in the fall. So it's not like a plumber connected a sink drain to the condensate return line, or I'd have this problem year around. I'd love to hear if anyone else has even had this problem, and/or new ideas on what can be done to diagnose it and prevent it from happening in the future. And yes, I know that 3-5 pounds is high. I'd rather run at 2-3 but my boss is fixated on "higher pressure is better" as in she wants 7-10 pounds, and I can only argue so much. It is odd -- at best -- that it only seems to occur in the winter. However, that water simply has to be coming into the system somewhere (an obvious remark -- sorry). It sounds as though you have eliminated the obvious villains -- the domestic hot water heat exchangers -- but if you can it might be worth double checking them. All three of them! The one in the new building is not exempt -- there might be a squirrely connection from there to the old building condensate returns somehow. I wonder if it might be possible to check which condensate line (or even steam line) is contributing the extra water? It might be that there is enough of it to make that line significantly cooler (or warmer, if it is DHW coming in), though that's kind of a long shot. I've currently got both heat exchangers for the domestic hot water isolated as they are supplemental to the separate domestic water heaters. I can't isolate the exchanger for the heating water, but am sure that isn't the issue as there is no automatic feed into that system, and it isn't losing pressure. If it were that system, I'd be receiving the water from it in the new part of the building, instead of where I'm getting too much water now in the old part. The glycol in the HW would also be showing up in the condensate if that part was leaking, and water chemistry testing is showing it clean of glycol. Are you sure there isn't a fresh water by-pass valve that may be leaking around the auto water system? I would guess one of the heat exchangers is shot. You may have it isolated it but the valves may not hold. Check the condensate returns from all the heat exchangers. If it's leaking by you probably have unions on the steam traps you could take them apart to check. No domestic water coil in the boiler I assume? Feed water to boiler feed tank leaking by? I have verified that there are no additional fresh water feeds into the system. In the old boiler room there are three valves in old feedwater line that are all shut off, and I can see where the end of the pipe goes into the condensate tank. That's got no water coming out of it. I also verified that there was no additional feedwater in the new boiler room, by shutting off the supply valves, and the RPZ valves. That made sure water wasn't leaking by without incrementing the meter that's in place recording how much fresh feed water is being added to the system. Each of the domestic water heat exchangers has been isolated both on the steam supply side and the condensate return side to the traps. I've verified that those are not leaking by opening the F&T trap, then cracking open the steam supply valve. I get steam through the exchangers when the valves are both open, and nada when either valve is closed. So both valves are closed. I've traced all of the steam and condensate piping through the exchangers to make sure that there aren't any additional connections to the steam system, and there are not. I know I've got one of the heat exchangers leaking, which is why it's currently isolated. The other domestic water heat exchanger is also isolated, just in case. Isolating and tracing out everything, but finding nothing is why this extra water in just the old half of the building is driving me nuts. And you are 100% sure that the boiler isn't surging and at times looking like it needs water, tripping the auto water system and the meter on that system just doesn't work? Fred, I'm really sure the system is not getting new feedwater without me knowing about it. The design of the system is like this - If the steam boiler feels that its water is low it will activate a pump to move water from the condensate tank to the boiler. That pump only runs long enough to bring the water level up in the boiler, typically about 30 seconds. There is also a sensor on the condensate tank that detects when it is less than half full (about 100 gallons left). That sensor activates the electronic valve letting a fresh supply of feedwater in from the potable system. The meter is on that water line. It also happens to have a couple of shut off valves for isolation and the RPZ valve, before the valve wired to the sensor. 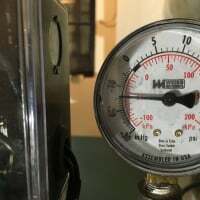 I've shut off those manual valves and found that the tank level still goes up over the course of a week, with no fresh feedwater coming into the system. 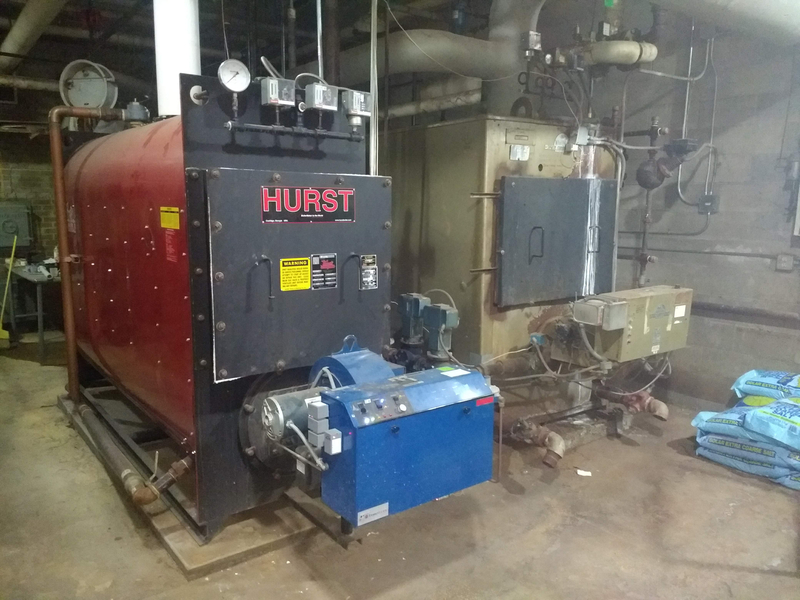 On the Hurst and WhirlPower steam boilers, all of the water going in is from the condensate tank, and neither one has a direct connection to fresh feedwater. Even doing a manual fill at the start of the heating season requires that all water move through the condensate tank before it goes into the boilers. For surging, the boilers used to until I got a handle on water chemistry. Doing better control of what's in the water helped eliminate the surging for me. I used to watch the water level bounce up and down in the sight glass, but haven't seen that in a very long time. That's all as it may be -- but water doesn't just show up of its own accord. At least not for us ordinary mortals (Moses, maybe... or Elijah... but not the rest of us). Somewhere in that system there is a water feed that most likely shouldn't be there. I'm sort of sorry to say this -- but I've usually come to regret it when I've said "well, it couldn't possibly be that" -- and it turned out that that was exactly what it was. @scottyanke , just curious. 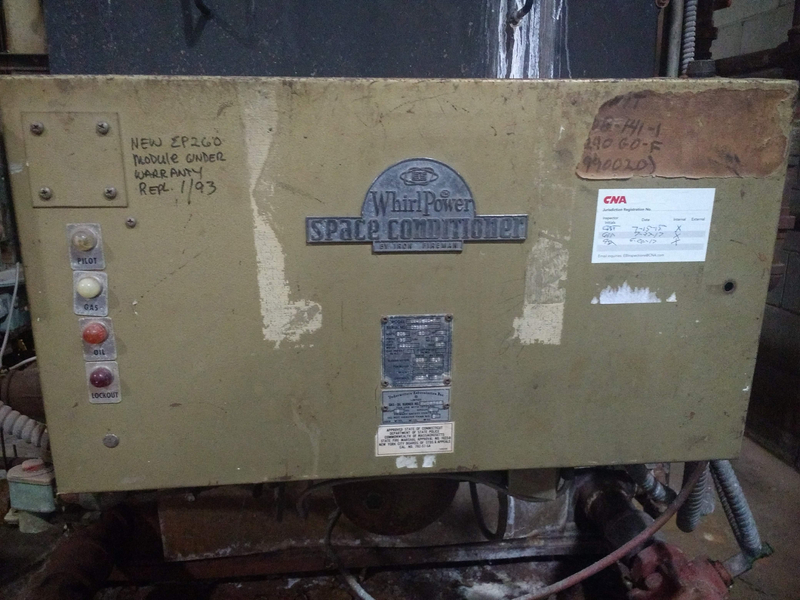 How old is the Whirlpower boiler? I used to sell those. Still have the Iron Fireman burner? it sounds like you are getting close to 300 to 600 gallons per week out of nowhere ? is that right ? Do you have any underground lines??? I have had them pick up ground water before. @coelcanth, I really am getting hundreds of gallons of water out of somewhere, but I (and every service tech) cannot find from where. I've even gone through the tunnels to make sure that a plumber didn't connect a sink drain to the condensate lines. In another month it will stop doing it, if it follows the normal pattern from previous years. @EBEBRATT-Ed, The WhirlPower is an Iron Fireman boiler and has the same burner. I believe it dates back to the early 1970's. We currently use it as a backup to the Hurst, although it got a lot of use with the extremely cold weather we had over the past week and a half. About a quarter of the firetubes have been replaced, and it has a Fireye controller that probably isn't original. That is a C240 Whirlpower. They made 3 different sizes E size was about 3,500,000 btu, F was 4,200,000 and the K burner was 5,250,000. Not sure who made that boiler for Iron Fireman but they were good boilers. IF started with the Whirlpower in the late 50s. They were way way ahead of their time forced draft burners, 3450 blower motors and 300# pumps on oil nozzle before anyone else had a clue. And they still burn as good as anything else available today. IF is out of business someone in Chicago bought them out but they dropped it a few years ago. Most parts are generic cept for the blower wheel which is a PITA to change. Our hospital had a problem with one boiler flooding. Each boiler had 2 LWCO, one was a feeder pump control like you have. The second LWCO was a water feeder directly into the boiler. Bad gate valve on the manual by-pass for the water feeder was passing water. Maintenance man spun his wheels looking for this, changed wrong parts etc. The broken union test would have shown it right away. Do you have 2 LWCO's on each of these? @JUGHNE, the WhirlPower has 2 feeds, one from the condensate tank and one from fresh water. The fresh water feed is manual, designed for filling an empty boiler. I've ruled that out by leaving the bottom blowdowns open on the (mostly) unused WhirlPower and keeping the boiler empty when it's not used. Any fresh water that might get in (or steam sneaking past the gate valve on the header) will drain out right away onto the floor. The Hurst gets all of its water from the condensate tank. I like "baby" boilers. Where I used to be has them, and they are so easy to maintain, start-up, and operate. They're half the physical size, and work so well, even in 90 year old school buildings. @EBEBRATT-Ed, sadly, I've still got the asbestos shell of a Kewanee in the old boiler room. 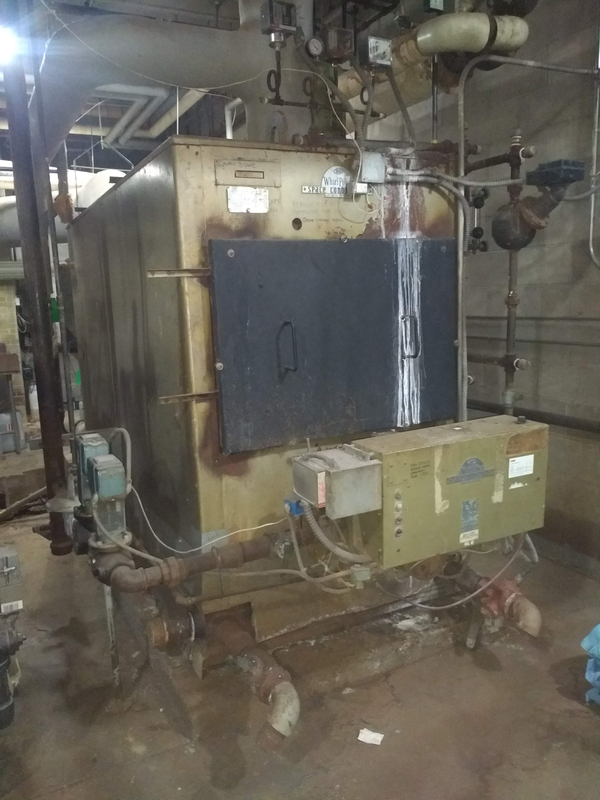 When it was shut down they disconnected all of the steam and water lines and exhaust stack, but left the burner in place. I keep intending to rip out the burner, but it works so well as an extra shelf I just don't have the heart to remove it. Thank you for the information on the WhirlPower. We have the F size, and it does work well. We've had good luck with fire tube repairs in Minneapolis with Moorhead Machinery & Boiler Company over the years on the WhirlPower. A thought. Do you have make up water that is not metered feeding your condensate return tanks? Could the water be coming from there? @Intplm, all of the make up water from the potable supply is metered. Another way to think of this problem is like a large salt water aquarium. They pump water continuously, and often through some kind of filtering mechanism mounted below the aquarium. Because there is some evaporation the occurs similar to what steam boilers experience, there is usually a simple feed system for make up water, typically from a 5 gallon jug under the aquarium. What I am experiencing is something like the aquarium overfilling with water, even though the level of water in the jug under the aquarium hasn't changed. Somewhere in the line from where water is pumped out to be filtered and where it goes back in, more water is ending up in the aquarium than went out. That's roughly equivalent to the steam going out and too much water coming back. The condensate tank in the old boiler room had make up water at one time, but for that water to enter the system it would have to make it past three ball valves, and me not seeing it dripping into the tank from above. All of the valves to that make up water are shut and have been confirmed to be shut. The last thing I can think of is a hose being used that hasn't been shut off or a cross connection at some over looked point. Check for any hose or hose adapters, hose wye connectors etc. A back flow preventer that has failed is a possibility. @Intplm, that's what I was thinking also. But unfortunately it only happens for 2 or 3 months in the middle of winter, and the tanks remain dry over the summer months when the steam system is shut down. I've traced all of the connections I could find throughout the tunnels under the building, to the point where I've got a hanging tag on every connection labeling what room it is for. Only a couple of sewer pipes cut through the steam tunnels, the rest go under the cement floor in the dirt. In the summer months I don't explicitly shut off the water going through the back flow preventer (RPZ). With the boilers shut off there is no demand for the automatic feed, and the tanks stay dry. If water was leaking past the feed valve the tank would stay dry in the summer. If it was a cross-connected pipe, like to a sink, then I would expect to see water in the tank over the summer months, but that doesn't happen. It is possible, as there are some pipes running through rebuilt sections of the building that I just can't get to, and hope they never leak or break. If you have DHW heat exchanger that has the cold supply shut off, but the hot supply is open and then a cross connection at a mop sink or such with the wye hose connection could back feed CW thru the HW piping into the shell/tube assembly. Then if there was a leak from HW side into steam side it ends up in the boiler...…..just an idea. And maybe they do not use that sink over the summer. My wife has worked at the same hospital for 40 years. She has told me a couple times over the years that the WC's are being flushed with hot water. I remind here to tell maint people that there is a problem with the mop sink faucet. They are always amazed why she would know that. They have a hose wye feeding the chemical cleaning liquids and have both H & C open, the faucet does not have check valves built in or they have failed. They just shut off the cold and eventually remove the handle to solve the problem. If you have had a new commercial grade faucet installed or "repaired" in a kitchen or medical area bath shower or.......? These types of faucets often have check valves built in or on the 3/8 supplies preventing this type of thing. If they have been removed or tampered with???? This could be something to look for. This type of work could have been done months ago with the effects not showing up long after the fact. It might be that simple. Hard to diagnose for sure. @JUGHNE, in my heat exchanger I've got the steam side and condensate side completely turned off, as I can heat the DHW with a separate standalone water heater. The exchanger effectively ends up just being a large domestic hot water tank, and works fairly well at being that. Sadly, I still get too much condensate back. Because of the way the plumbing was put in, I am unable to isolate the DHW side of the tank without shutting down all DHW for half of the building. I can isolate the steam system from it, which I've done, but not the DHW, and since the steam side is isolated I'm not that worried about it. I concur with you on the back flow preventers on the mop sinks. We've had times when we had to shut off water to sections of the building because of bad valves, and water would back up the closed off pipe under pressure because of a mop bucket Y-connection. It's amazing how much hot water you can get from a closed off cold water pipe that isn't exactly closed! Since this is happening at only a specific time of year, and not any other time of year. I would ask myself what changes take place in the building at that said time of year? I would ask what is happening in the building that is not happening during the rest of the year and make a list. Might sound trivial at first but what do you have to lose? What is turned on that isn't on at any other time of year? What part of the building is getting more use, less use? Are people being moved from one area to use more of the building than the rest of the year? Is the laundry being used differently? The heating system "is" being used differently. Foot traffic patterns and building use issues need to be isolated so that you can more accurately review them. I know it is frustrating but if some of the things that I have listed or that you can make a list of, can help to find where to look. If, in that list you are doing things within a span of a day or week? You may want to consider spreading out those things......those changes in use to help narrow down as to why the the extra water is showing up. I know your frustration. I have had similar issues and found them by isolating uses over time. And try to figure out what was done ten years ago? Did they twin together some hidden water feed that is not metered that is being triggered for use during those few months that is allowing for the extra water? Isolate the areas of use and work from there from your written list. Good idea. And leave nothing out. One of the axioms of trouble shooting is that after you have eliminated all the reasonable and relevant possibilities, all that's left is the impossible or irrelevant -- and it's going to be one of those. If your heat exchanger is still pressurized with DHW but your steam valves are off, you could have a leak in the exchanger allowing DHW to push thru a less than perfect steam valve. The steam valve may seal the lower steam pressure but not prevent back flow from the DHW pressure...………so with the steam side isolated and if there was a drain plug to open on the steam side of the shell and then if water came out from the leaking tube via the shell drain, that would be an indicator.